According to T.A.H. Seismologists (yes, we have two – both Corgies), the Virginia earthquake was caused by a backlash from Iowa that cuased vibrations to build up as the cloud of woe moved east eventually settling in Mineral, VA. The rest is history. The whole mess got started when Iowa and Iowa State unveiled the new trophy which was meant to be awarded to the winner of their annual rivalry game. 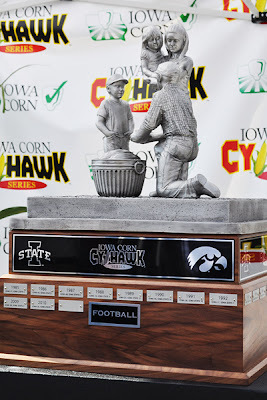 With the Iowa Corn Growers Association as the new sponsor of the series between Iowa State's Cyclones and Iowa's Hawkeyes, the new trophy was drawn up as a farm family huddled around a bushel of corn. The design was a nod to the state's deep agricultural roots and, of course, corn is a primary staple around here. It was unveiled Friday at the state fair. And everyone pretty much hated it, likening it to a garage sale leftover or something from the Precious Moments catalog. Newspaper chats, Twitter and Facebook lit up with critics, and even former Iowa coach Hayden Fry and Iowa Gov. Terry Branstad weighed in against the new design. Craig Floss, the CEO of the corn growers group, said the response showed the passion Iowa fans have for football. "The overwhelming feedback has been negative," he said. "Nobody liked it. I think the best comment I heard was, 'That's going to the losers, right?' 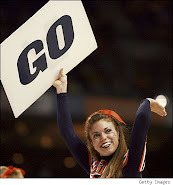 " said Liz Ulin, a 23-year-old senior studying health science. Officials from both Iowa and Iowa State said the process of coming up with a new trophy for the local rivalry was a collaborative effort between the schools and the corn growers group. Rick Klatt, associate athletic director at Iowa, said everyone hopes the new trophy would represent what makes Iowa special and what it means to live and work in Iowa. "What we've learned is our fans want a football trophy," Klatt said. "So we will ask our fans to help build us a football trophy." He said when he saw it for the first time, he was pleased with it. "We aimed high and we missed," Klatt said. * Unfortunately, items in italics may be true.